To survive as a trader or investor you need that professional "edge" or you are destined to fail. That edge is implementing correct Money Risk Management principles in your trading decisions. The professionals use them and NOW you can too. What I am sharing with you here today is not anything new but a sophisticated strategy used by professional traders and investors globally in all market conditions for decades. All I am doing for you here today is trying to simplify these principles for you so that you can understand them and have the confidence to implement them in your trading and/or investing. I will begin with Risk Management or Stop Placement. The professionals use various technical analysis techniques that are "invisible" to the majority of novice and seasoned traders. Have you ever felt that the market always seems to "know" exactly where your stops are? Have you been frustrated by the market triggering your stop, and then rebounding back in the preferred direction of your original trade? Perhaps sometimes you feel that the market was intentionally gunning for your stops? The bad news is... They are! Stop running or Stop gunning is a common technique employed by Floor Traders. Definition: Stop-running or Stop-gunning (both terms are used) occurs when a share price is pushed through a support or resistance price level in order to trigger the stops that are hiding there. After the stop supply is exhausted, the market bounces back in the other direction, usually winding up where it was before the exercise began. Professional Traders know where your Stops are so where should you place your initial Stop Loss? Your stop loss acts as a trigger and is a price level at which you will exit the trade. This price level should be determined prior to the trade being opened, where possible. The stop loss is the point at which you will exit the trade "no questions asked". A stop loss will help preserve your trading capital to make sure you can trade another day. Remember, a stop loss is simply a mechanism which signals the exit of a trade. A price level where you must take action and close that trade first opportunity and move on to trade another day. John has decided to buy $20,000 worth of "XYZ" shares using a portion of his current $50,000 (the author would not risk more than 20% of his Trading Capital in any one trade e.g. $50,000 x 20% = $10,000) and has decided not to risk more than 1.5% of his trading capital on the trade. John calculates his initial Stop Loss for this trade to be $1.925 (($20,000 - $750) / 10,000), so if hit the maximum loss will be $750 and John would immediately close this trade and sell his holding in "XYZ". A trailing stop loss is a price level which moves in accordance to the share price (Author prefers to use an 8 period ATR (Average True Range) Volatility Indicator with a 10 period EMA applied for medium term trading. If you can imagine the share price constantly rising, you would want to protect some of the unrealized profit. 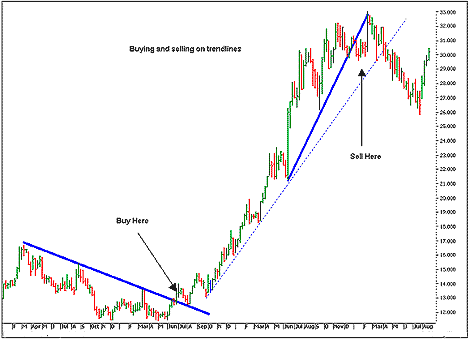 You can do this with the use of a trailing stop loss, the same concept of a stop loss still applies. That is, the trade is immediately exited when the current price reaches the trailing stop loss price. The most important thing to remember about any stop loss is its importance in signaling an exit point where you must act and close that open trade. Many believe the exit is far more important than the entry. Always protect your trading capital to ensure you have the capital to trade another day! After share trading, educating and selling various forms of Technical Analysis Stock Trading Software both to novice and seasoned traders for over 10 years I found both Technical and Percentage Stops were being placed in or around the same price level by the majority of traders and investors. These were triggered and trades closed normally just before the share price rebounded back in the preferred direction. These Stop Loss price levels were generally near major support and resistance or when looking at market depth at key 0 and 5 price levels. E.g. $1.10, 2.20, $1.85, $2.25, etc. so I researched and found a Stop Loss Placement strategy that would control the risk I was exposed to but would still best optimize my trading capital. It produced a far less frustrating result and also prevents over trading. The strategy I use is based on 2 very important rules. The first is to never risk more than 2% of your trading capital on any one trade! The second rule is limiting trade value for any one trade to a maximum of 20% of your trading capital, allowing for brokerage. e.g. I have $25,000 in Trading Capital, last close of the company share I am interested in purchasing is $10 and I am allowed to allocate a maximum of $5000 (20% x $25,000) on this trade, brokerage is $50 each way ($100 round trip) so my maximum risk of 2% is $500 less brokerage = $400 so I buy 470 shares ($4,700 + $50 brokerage = $4,750) and so set my stop loss at $9.15 risking 85c per share or 8.5% so if my Initial Stop Loss is hit I have only lost a maximum of $500, which includes my brokerage. ($9.15 x 470 shares less $50 brokerage is $4250.50 from $4750 is $499.50) This makes determining your Stop Loss price level harder to determine by the market as it is not based on Technical Analysis but by correct Money Risk Management principles. These values and many more are all calculated for you automatically with JBL Risk Manager version 8 (JBLRM8) and I urge you to trial it for yourself. It is very simple to use, includes a user friendly operation manual (PDF format) and is available from resellers globally or please visit my website and trial it there. A translated Spanish version is also available. Trial JBLRM8 for simplicity, accuracy and stress free trading and reporting. How to Follow and Identify that Trend for Entry? The concept of trends is the simplest and most effective way to trade or invest safely, whether you are a novice investor or an experienced trader. However, what I find is that many traders try to complicate their trading by adding more tools and rules than they know what to do with. The end result is confusion and ineffective trading. Charles Dow, the father of technical analysis, and who the American Dow Jones index is named after, refers to trends in these simple terms. An up trend must have higher peaks and higher troughs while a downtrend requires lower peaks and lower troughs. To the day trader an up trend means that the current daily bar must have a higher high and a higher low than the previous daily bar to indicate an up trend. To the day trader the downtrend is exactly the opposite of the above. To the medium to longer-term trader, this would mean a higher peak and a higher trough than the previous peak and trough measured on a weekly bar chart. This may take place over several weeks or even months. Example 1 below illustrates this. Example 1 reflects a typical up trend pattern as espoused by Charles Dow. To make a higher peak you must have a movement up in price followed by a down movement in price. This is achieved by having a series of successively higher bars that lead to the peak, followed by a series of successively lower bars that fall away from the peak. To make a trough you need to have a down movement in price followed by an upward movement in price. This is achieved by having a series of successively lower bars that lead to a trough, followed by a series of higher bars that rise up from the trough. These patterns can unfold on a daily, weekly or monthly bar chart. You're trading plan and time frame will dictate how you trade this pattern. The inverse of an uptrend is a downtrend; that is lower peaks and lower troughs. Your investment time frame will tell you when you should enter or exit a trade. Assuming you are using the theory that you want to buy a stock that is trending up, then you would buy the stock the moment it fills the rules of an up trend. That is, you would buy the moment you have a higher trough followed by a higher peak. This would be the point at which the stock trades one cent above the previous peak after forming a higher trough. Example 2 below illustrates this. In Example 2, the stock made a higher trough and then it rose in price above the high of the previous peak. The moment it does this the stock is said to be in an up trend. According to the Dow Theory you buy the stock at the earliest probable time that it is in an uptrend. Based on my experience, if you are trading shorter time frames, for example a number of weeks, then this theory will work well. However, for the medium to longer-term trader you will notice during the long up trend of a stock, that the pattern illustrated in Example 2 is repeated several times over a matter of months or even years. Thus, a longer-term investor or trader would only want to get in at the first sign of a new up trend forming so that they are in a position to profit for the duration of the long term up trend. Obviously, you would not want to get in near the end of the up trend. So, how do we define which is the start of a new longer term up trend and the end of the up trend. This is where we look outside of Dow's Theory to W D Gann and others. Gann states that a counter trend is 1 to 4 bars or 7 to 11 bars. For those of you who don't know, a counter trend is a movement in the opposite direction to the prevailing trend. As illustrated in Example 3 below, we have a stock that has 5 bars (daily or weekly) moving the price in one direction (which could reflect the beginning of a new trend) followed by a movement of two bars in the opposite direction. From this point the stock turns and moves down in price in the same direction as the original 5 bars. Once this happens we can assume that the two bars that moved opposite or counter to the original 5 bars was in fact a counter trend, with the original 5 bars part of a newly formed trend. The trend itself, however, must fall outside the parameters of a counter trend. This means that if a stock has been rising and/or falling for more than 11 bars then it is considered to be in a trend. If it has only raised 3 bars then it is quite possibly only in a counter trend or movement counter to the trend. The additional countertrend information you gain from your charts will assist you in assessing a trend when using Dow's theory of higher peaks and troughs for up trends and lower peaks and troughs for down trends. 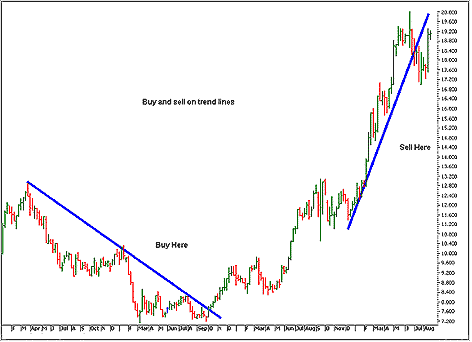 For the medium to longer term trader you also need to incorporate trend lines so that you only buy when a stock changes from a downtrend to an up trend. Therefore, you need to define the parameters of an up trend. To do this you start at a peak in the price and then look for successively lower peaks and troughs. You should be able to identify from this that the stock is down trending. Now you get out your ruler and pencil, and draw a line across the peaks of this down trend; you need two or more peaks to make a straight line. I prefer three peaks as a minimum because with only two peaks it is considered an unconfirmed trend line. Example 4 demonstrates this for you. The best way to avoid blowing out your trading account is to remove emotion and to develop a consistent method of maintaining control over your trading losses and portfolio risk. Many traders think that just by using stop-losses alone will do the trick, but that’s only one part of the equation. Successful equity protection involves account management & reporting, position sizing, and sector balance as well as good exit strategies that are clear. The latest JBL Risk Manager Version 9.3 was created to incorporate all of those factors, and more, in an easy-to-use, user friendly format. JBL Risk Manager is a standalone money and trade risk management software program for stock traders that operates independent of any charting service, trading system, or brokerage platform. Currently, it provides access to 15 major stock exchanges throughout the world. The software requires local end-of-day price data downloaded in the older MetaStock data format, which is still offered by many vendors today. However, if that data format is not available, the software also incorporates price data updates free of charge for the stock symbol & exchange you wish to trade. The trader launches the JBL Risk Manager only after deciding which stock to trade and when and before actually placing the trade. The software opens with a trading summary screen (if only one portfolio exists) that tracks the open and closed trade information, win/loss percentage, draw-down, average dollar trade expectancy, and trading system efficiency for each portfolio. But first, the user needs to activate the four tabs or buttons at the bottom of the screen that takes the trader through the simple steps necessary to set the conditions for each trade within the nominated portfolio. Each step must be completed before the program allows you to enable the next tab. Create New/Load Portfolio Tab: The first tab, is the place to create and name a portfolio. The software permits the user to create almost an unlimited number of portfolios, which is useful for separating different stock trading systems or for users with more than one trading account. There is no limit to the number of stocks that may be added to each portfolio but can be managed in the Settings page. Settings Tab: The next tab takes the user to the settings screen, where decisions are made about trade length (Medium term is default), trailing/profit stops, money management (Maximum Risk or loss that will be tolerated for each trade) and brokerage fees. The software will automatically default to settings that will most probably suit most traders. However, each of the settings may be changed to meet individual user preferences and risk tolerance. The settings screen also stores information about the price data path location, whether it be local Metastock format data or Internet Price Data updates from exchanges globally. Users may select from a large list of stock exchanges. These include exchanges in the US (NASDAQ, NYSE, AMEX) as well as countries and cities including Australia (ASX), New Zealand (NZX), London (LSE), Singapore (SGX), Hong Kong (HKEX), Bombay (BSE), India (NSE), Shanghai (SSE), Toronto (TSX), Sao Paulo, Brasil (SAO), Berliner Borse (BSE), and Deutsche Borse (XETRA). Once a stock exchange is selected, the software automatically inputs the correct default currency and price ranges used for the stocks in that exchange. Manage Capital Tab: In the third tab, manage capital, the user types in the amount of money in a trading account to allocate to this portfolio. They may also amend with withdrawals or deposits made for each portfolio. Trade Tab: The fourth tab, lets the user identify the trade as either long (buy) or short (sell), and lets the user select the stock symbol, the expected buy date, and the anticipated buy price. It is recommended, but not required, that the user also enter the market sector for that stock ( if not auto-filled) and jot down in the diary the reason for wanting to buy or sell that particular stock or any information that may be of interest. From here, the software uses the information derived from the Settings and the manage capital pages to automatically fill in the salient facts regarding the potential trade. Among the automated items provided on the trade screen is the amount of core capital available for trading, the amount of cash to use for the trade, the recommended number of shares to buy, the total cost including brokerage fees, the suggested initial stop based on your risk tolerance, which may be amended and the break-even price. For added measure, it also supplies the daily floor traders’ pivot points to help identify potential near-term support or resistance. Survival features: The JBL Risk Manager contains several features that enable traders to maintain a consistent, disciplined approach to preserving and growing their trading account. The software incorporates a concept called core trading capital, which considers a more real time view of the trading capital available to the trader. According to the PDF user manual that comes with the software, core trading capital is based on a combination of available cash, plus any realized trading capital, that is, your initial trade value plus or minus the profit or loss that would occur if each open position stop were hit. That concept underlies the calculations for stop-loss and money management guidelines. The first rule is related to initial risk management and is probably familiar to most traders. It states that you should never risk more than 2% of your core trading capital on any one trade. Traders are able to select stocks from 15 major exchanges, insert brokerage fees, and indicate preferred trading duration. The software automatically determines the appropriate type of trailing exit placement and percent of trade size to risk. Once the trader inserts the symbol and selects the anticipated trade date, the software recommends the number of shares to purchase, initial stop, and displays the maximum risk based on the last close. After confirming the quantity, it displays the break-even price and which trailing stop is being used, when in profit and whether to hold or exit the trade. The user may follow or change any of the recommendations. The second rule pertains to the amount of trading capital available for any one position. The guideline states that you should never trade with more than 20% of your core trading capital on any one trade. In fact, to be on the safe side, the program defaults to a 19% trade size so that funds are available for slippage or other expenses. Both guidelines constitute the basic rules for accounts $50,000 or less and are automatically integrated into the software calculations for each trade entered. The percentages for risk and position size decrease for trading accounts greater than $50,000. The factors of risk and trade size, along with the entry price and initial stop-loss, determine the number of shares the program recommends per trade. Changes the user makes to the entry or stop-loss price may create a change in the number of shares the program recommends in order to maintain the proper risk and trade size balance. Stop-loss and profit-taking: The program offers several built-in and user-defined features for determining stop-loss placement including initial stops, trailing stops, profit-targets, and time-based stops. The software recommends an initial stop-loss placement based on an algorithm that prevents losing more than the pre-allocated amount of trading capital. However, the user may enter his or her own preferred initial stop. Taking into consideration brokerage fees, the software also determines the break-even price. Once the breakeven price has been hit, the software converts from the initial stop to a trailing stop that uses either a modified (10 period EMA applied) to average true range (ATR) calculation or a fixed percentage, whichever the program determines will provide the best profit safety. The system highlights which trailing stop is in control. One of the more unique features of the program is the way the software automatically changes the ATR and fixed percentage stops depending on the user’s trading length preferences—short-, medium-, or longer-term. Some traders prefer to be in a trade for only a few days, others for weeks, and still others for months. The program allows the user to select independent time lengths for each individual portfolio. For example, in some cases, a person who usually is a trend follower using the medium-term length may decide to take a countertrend trade expected to last only a few days. For that trade, the user would select the short length and the trailing stops would adjust accordingly. The trailing stops also change depending on the price of the stock. As seen in the Settings screen, the ATR and fixed percent decrease for higher-priced stocks. At any time during the trade, the user may elect to override the current trailing stop with one of his or her stops. If a stock does not reach breakeven within 10 days, the software automatically suggests the user exit the trade so the trading capital can be put to better use. At the end of each trading day, the user updates new price information, either from the local Metastock data path or the Internet, for the stocks being traded. If no stop has been hit, the program produces a large green sign that says “HOLD.” But once price has triggered one of the stop-loss levels, the software displays a red EXIT sign It is then up to the user to determine whether to exit the trade at some point on the following day or whether to stay in the trade. The user will manually enter the actual exit price when the trade has been closed for accurate reporting. I wish you all trading success! Company Name: Park Avenue Consulting. Disclaimer: The information contained in this report is based on factual information about securities and securities markets only. It should not be assumed that the methods, techniques or indicators presented will be profitable or that they will not result in losses. Past results are not necessarily indicative of future results. The information contained herein does not involve any recommendations in relation to your personal financial circumstances or investment needs and does not provide any investment advice. Examples presented are for educational purposes only. Any stocks, options, warrants or futures mentioned are not a recommendation to buy, sell or hold but merely a study of past performance. Before making any investment decisions you should obtain independent investment advice. Park Avenue Consulting and its representatives and officers will not accept liability for any loss, damage or expense incurred or suffered by you if you rely on any information provided in making investment decisions. Disclaimer: Park Avenue Consulting provides the material on this web site for informational/educational purposes. Investments and investing strategies are personal, conditional on many factors. No mention of a particular security on this site constitutes a recommendation to readers to buy, sell or hold that security. No discussion or evaluation of any particular investing strategy on this site constitutes a recommendation to readers to employ the strategy. Readers are responsible for their own investment research and decisions.